Friday, Dec. 16 at 7:30 p.m.—RANDOLPH—Chandler Center for the Arts presents Darlingside, a new and widely popular Boston-based Americana quartet, on Dec. 16 at 7:30 p.m., with local singer-songwriter Kris Gruin opening the show. Darlingside’s wide-open arrangements are marked by the skillful vocal interplay of the four singers. When bassist Dave Senft, guitarist and banjo player Don Mitchell, classical violinist and folk mandolinist Auyon Mukharji, and cellist and guitar picker Harris Paseltiner gather around a single microphone and let their richly-textured voices loose, they splash their melodies with a sunny melancholy that brings their lyrics to vibrant life. Subtle musical shadings take cues from 60s folk, chamber pop, bluegrass, classical music, and modern indie rock, while aching harmonies are complemented by tones from the harmonium, frailing banjo, 12-string electric guitar, Wurlitzer, auto-chord organ, and grand piano. The result is a collection of quietly passionate songs that defy easy categorization. The members of Darlingside met at Williams College in western Massachusetts. “Auyon and I were paired as freshman year roommates,” Senft recalls. “We fought often, but we spent so much time together that we very quickly became like brothers.” They joined a singing group with Mitchell, and Paseltiner joined the same group two years later. From there, the four bonded over a shared interest in songwriting, despite a diversity of musical backgrounds and performance styles including chamber music, choral singing, Celtic session playing, and street busking. The band now performs the songs the same way they practice and write them—seeing them live is like sitting in their living room. There are still vestiges of their rock roots: electric guitar fuzz and ambient feedback creep into otherwise acoustic arrangements. But in their new format, sans drums, voices and melody have shifted to the forefront—a shift that has become important to the band. 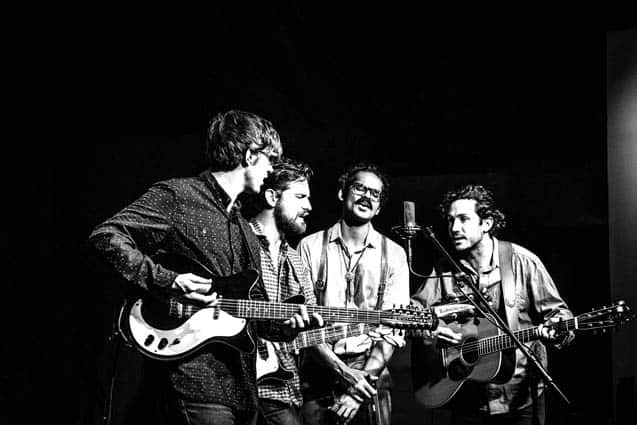 In the 2015, Darlingside won Artist of the Year at the International Folk Alliance. The band has released at least three albums, each receiving numerous accolades and praises. Most recently, Darlingside supported Patty Griffin on an extensive national tour. Kris Gruin, from Montpelier Vermont, opens the show at 7:30 p.m. with a short set of original music. His Americana influenced new folk is grounded in the tradition of great narrative songwriters like Cat Stevens and Paul Simon and yet Kris’s voice is strikingly current. A New York City native who’s put down roots in Vermont, Gruin effortlessly blends sagacious wit and emotional depth. Tickets are available by calling the Chandler box office between 12-5 p.m., Monday-Friday, at 802-728-6464 or online at chandler-arts.org. Chandler Music Hall is fully accessible and equipped for the hearing impaired. It is located at 71-73 Main Street, Randolph.